Bowen Merlin (I love his name) he’s the new band director for Lancaster’s high school. Bowen leaves New York and Scarlet (his best friend) for this quiet little town. Felix Hansen has lived in Lancaster for 10 years now. He’s the owner of Snowy Ridge Apple Orchard. He’s also a single dad and has burn scars on him. Felix is quiet and discreet. 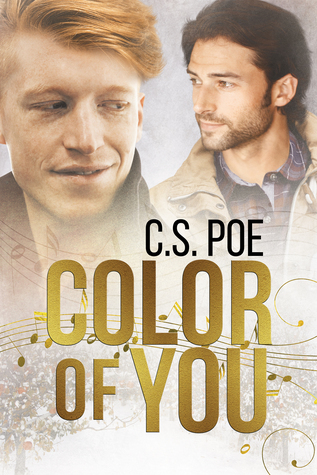 When Bowen and Felix meet, everything seems possible for them except when life (especially people) decide to test them. It was a beautiful, poetic, love story. Bowen is the band director but not only. He’s also a great musician. He can play dozens of instruments, he has an absolute pitch, and he sees sounds. Especially music and voices. He has synesthesia, which means that he can see music, literally sees it with color. I loved it, I found it poetic. I loved how he describes people with colors. He’s also dominant, loves to take charge of things even if he looks like a dandy and people (lovers) assume he’s submissive. Felix is more discreet, quiet and shy. Because of his past, he’s not very confident. He looks like a big lumberjack but only in appearance, and like Bowen, people assume Felix is an Alpha when he’s not. They fit perfectly together. And they were so sweet and beautiful. And Alan, Felix’s son, was adorable and very protective of his dad. I really enjoyed this book, with a good plot, a twist in the middle of the story and a beautiful ending. The only thing that bothered me a little bit was the paradox between Bowen’s attitude in bed and how he claims himself as a dominant and how he reacts in front of a problem…passive. When problems came to them (and not tiny problems) Bowen was passive, it was other people who reacted to it. I found it incoherent with his temper. Anyway, it didn’t spoil the book, and I still enjoyed it a lot. It’s 4 OptimuMMs for this rainbow of sound.